The plasma process has evolved over the years into a highly flexible coatings system capable of applying a wide range of materials. These include most metals/alloys, ceramics, cermets and composites. An inert gas (typically Argon), when excited by an electric arc, becomes partially ionised and in this state is able to carry an electric current. This generates a hot gas stream having temperatures of approximately 15,000°C. Powder material is then injected into the heat source at optimum conditions and projected in a semi-molten (plastic) state onto a suitably prepared work piece to form high integrity coatings of typically 0.05 mm to 4 mm in thickness (depending on the type of coating). The gun is manipulated by hand or by using a robot, enabling a wide range of component configurations to be coated. 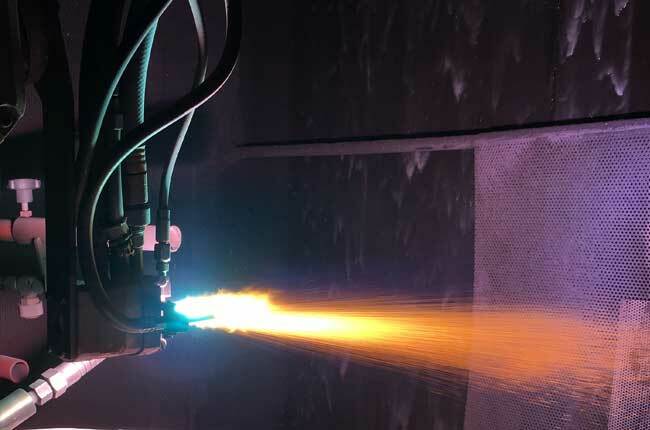 HVOF spraying has been developed principally to produce high quality metal and carbide coatings equivalent to the D – Gun process and with superior properties to conventional flame spray processes. The HVOF process typically uses hydrogen as the fuel gas mixed with oxygen to give coatings of the highest quality. The gas mixture is supplied at high pressure and combusted to produce a high velocity flame with a temperature of up to 3,000°C. Powder material is then injected through the flame and the molten particles are accelerated up to velocities greater than the speed of sound which are then impacted onto the work piece. Precise control of all spraying parameters and powder feed rates; and the use of a robot to precisely position the gun, enables high quality coatings to be consistently applied on a large variety of different components. high hardness (e.g. Tungsten Carbide Cobalt, WC/Co). fine surface finish in as-sprayed condition, or able to be ground or lapped to a superfine finish. Wire spraying is used to apply a number of different metals and their alloys. Commonly used in the build up of mis-machined parts; for applying corrosion resistant coatings to steelwork and as a bearing material. A wire spray gun uses oxygen and acetylene to produce a flame through which metal wire is fed and melted into droplets. The resultant molten metal is atomised by compressed gas and sprayed on to the prepared surface to form the coating. 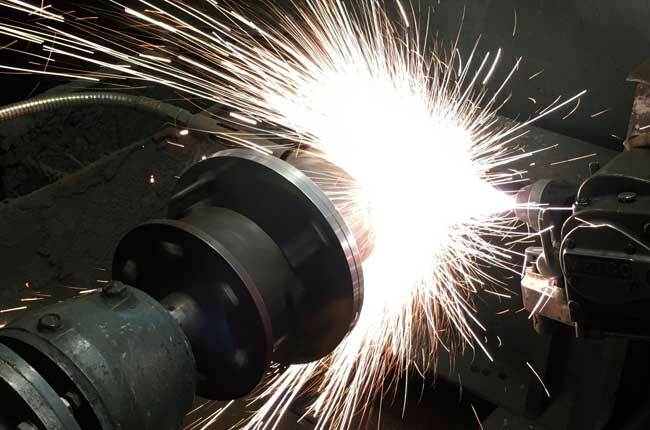 In many cases, wire spraying is a lower cost alternative to the plasma spray process for applying metals and is generally capable of building up thicker coatings than plasma. 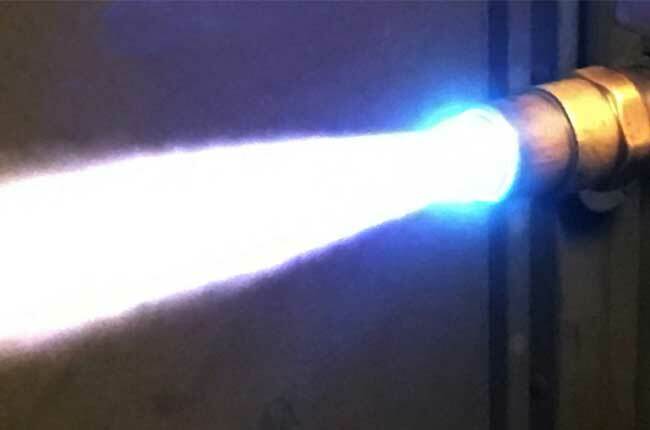 However, the range of available materials that can be sprayed is much lower than that for plasma. 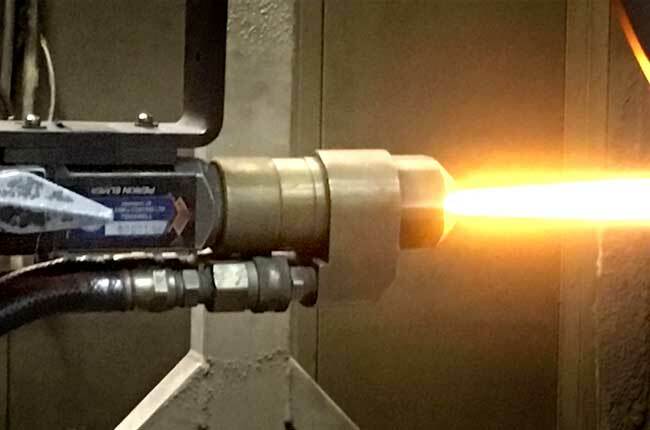 Flame spraying is primarily used to apply abradable coatings or nickel/chrome self-fluxing alloys which are subsequently heat treated in order to metallurgically bond them to the substrate (Fused Coatings). Abradable coatings are used for machine element clearance in gas turbine compressors. Fused coatings are extensively used in high wear applications such as mining and steel industries to prevent wear of rolls, pistons and other equipment in aggressive wear environments. A Flame Spray gun uses oxygen and fuel gasesoxygen and a fuel gas to produce a flame into which powder is then injected. The resultant molten particles of powder are projected onto the work piece to produce the coating. Many coatings sprayed using this process are then heat treated at around 1000°C to ‘fuse’ and enhance the coating cohesive and adhesive properties on the substrate surface. 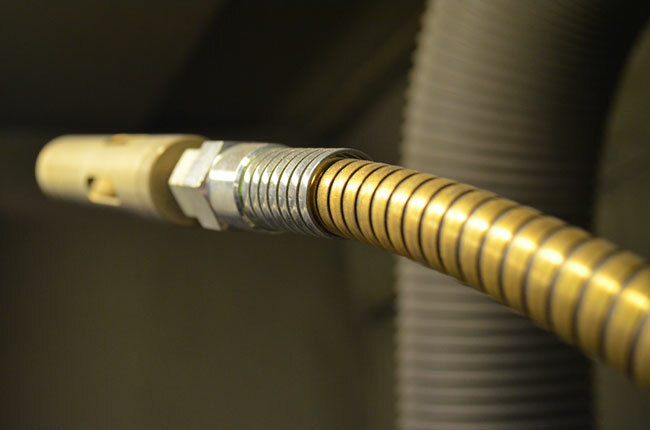 Fused coatings produced by this process are extremely hard and corrosion resistant and are able to withstand wear by abrasion, fretting, cavitation or by contact with other hard surfaces. The addition of different proportions of carbon, silicon and boron to the basic nickel/chromium alloy results in the formation of hard phases of carbides, silicide and borides. The coatings can be applied 1 – 5 mm thick; much thicker than hard wear resistant coatings applied by the plasma or HVOF processes. The PLASTALLIUM™ system holds benefits for CEMENTED and CEMENTLESS fixation applications and is employed regularly in both approaches. The surface topography of PLASTALLIUM™ 212 is ideal for mechanical interlocking of cement or bone. In the latter case, an additional coating layer of bio-conductive material (e.g. CAPTAL™ Hydroxyapatite) is employed to promote apposition of good quality bone to the implant.